The new fair queen addresses visiting queens who will form her cortege. There are two Santa “Cruces”: the upper, traditional town and the lower, lakeside district; they are a twain that meet at fair time like they never do otherwise. The lower town is heavy with resorts and expats; the upper town clings to custom and sheer mountainsides. There are no motor roads into them and, understandably, no cars. This shields Santa Cruz from the invasion of video games that vulgarize most ferias, but chingolingos — ring-toss and other classical amusements that predate electrification—abound in the upper town. Garish Ferris wheels, likewise too big to bring in, are not seen. One palpable intrusion of modernity is the piñata-class plastic toys. The vendors of anything small enough to bring by boat are present in force, but their wares are a novelty here. These items, seen year-round elsewhere, appear only at feria time. Consequently, youngsters and their grandparents examine them with unjaded curiosity. The two districts are linked by a road that, by its length and steepness, separates upper from lower as much as it joins them. It is no walk but a hike, and no ordinary hike at that. Lake Atitlán fills its vista, and those on the road at dusk can watch spectacular sunsets give way to the lighted clusters of Atitlán’s other and far-flung towns. Feria season lends a unique enhancement to this scenery, infecting everyone present with the unity seen among employees working together on a holiday. There is a sense that, for a few days, everything is different. 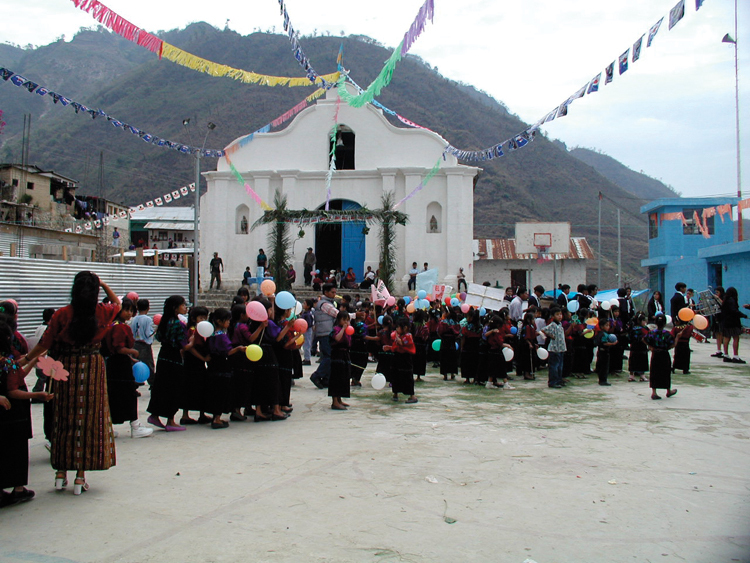 Since the event is a “county fair” in a county with no roads other than the twisted umbilical linking Santa Cruces two unequal personalities, it is a moment when rural cruceños “go to town.” Many go farther still, taking the boat into Panajachel for annual shopping and browsing. This is as close as some ever come to Guatemala City or Quetzaltenango. The vetting for fair queen begins in April and culminates on May 8 with the investiture of the winner. Other highland queens, attired in dazzling finery and headdresses, come to assist with the coronation. “But these poor girls arrive in the late afternoon the day before,” says Ratcliffe, “when the Xocomil has whipped up the lake. And most have never been on a boat.” Some of the queens are seasick by landfall. 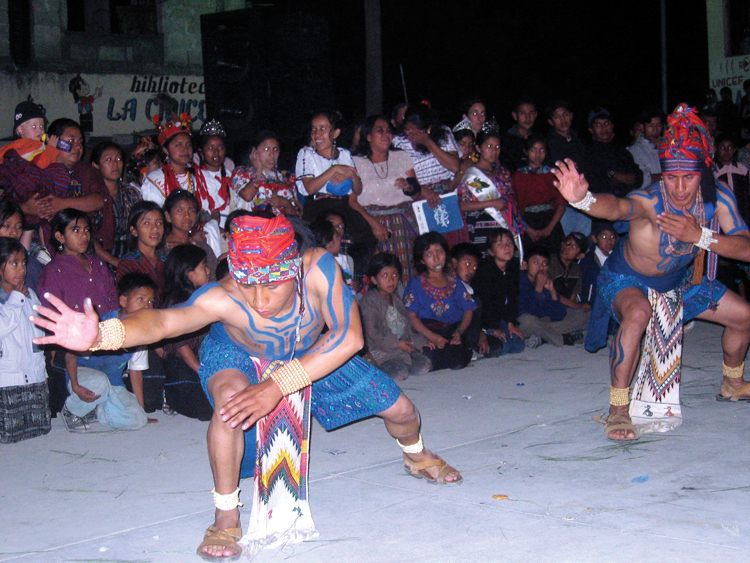 Santa Cruz, like Guatemala as a whole, is today largely Protestant. 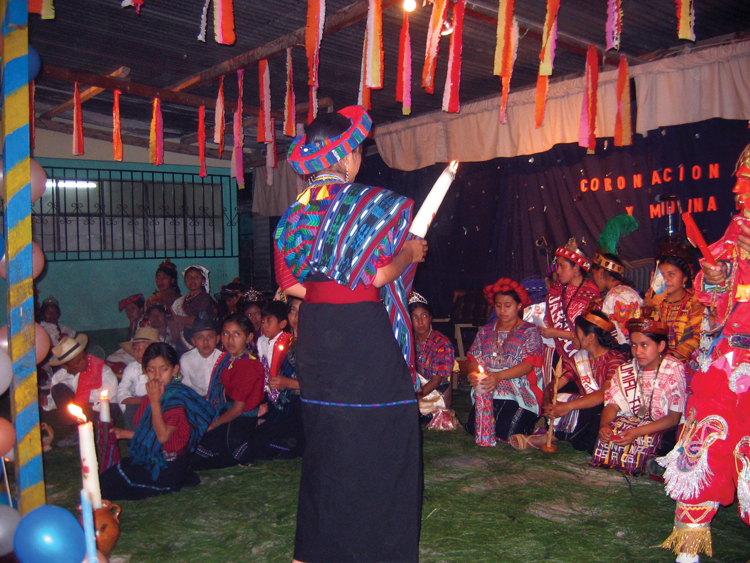 But the pageantry of Guatemala’s Catholic heritage survives here. The latter, the town’s premier social event, takes place on May 9. It resembles parades in other towns in that the marchers equal or exceed the spectators. 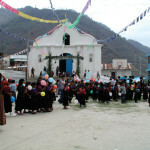 Schools send their whole student body, and the city officials and the cofradía (town elders) are feted. Entire church congregations fold themselves in. But this parade snakes from lower to upper Santa Cruz—no small feat for for adolescent tuba players at high altitude. 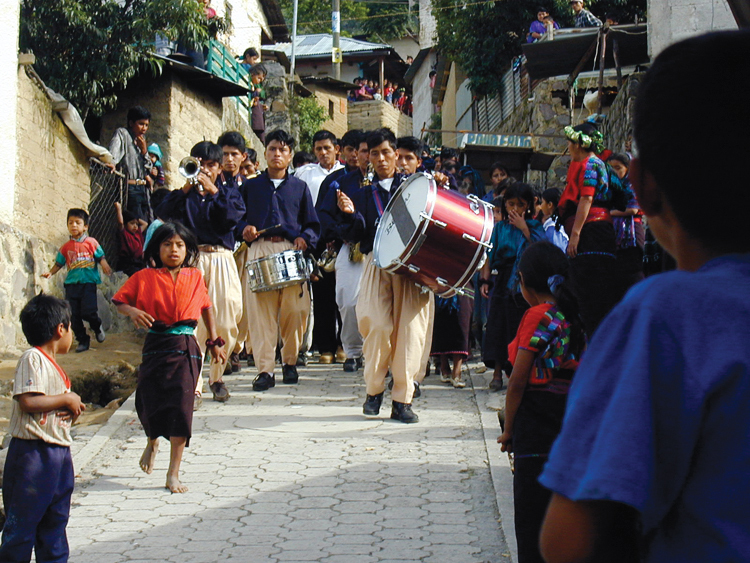 The marimbas come out this day and are played continually and ambiently for three days. 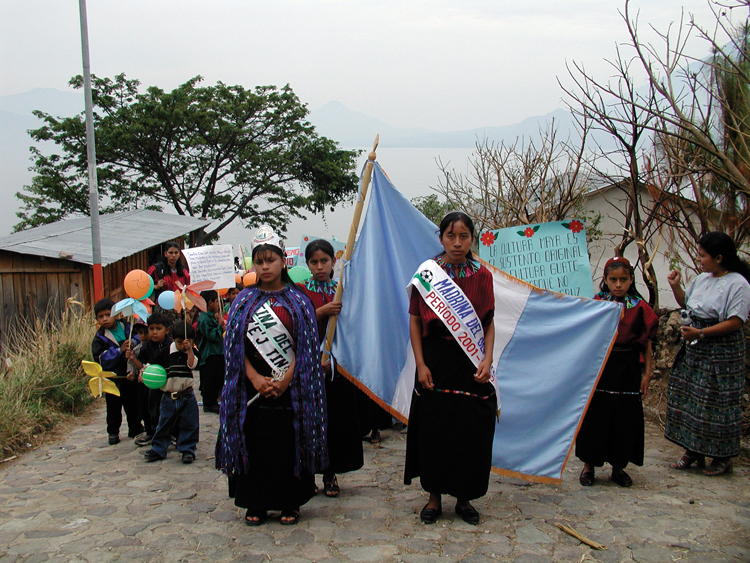 The other parade follows on May 10, the principal day. 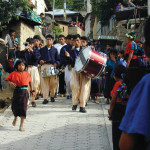 A solemn procession honors the Virgin Mary and the town patron, St. Helena of the Cross (Santa Elena de la Cruz), and their statues are marched on litters around upper Santa Cruz. No relics of Helena—bones, garment fragments, etc.—are held in the church vaults, but locals still petition her for miracles. Helena, mother of Constantine the Great, the first Christian emperor of Rome, is the protagonist of Evelyn Waugh’s novel, Helena. The story records that she had brushes with martyrdom but died peacefully at 80. Hollywood’s portrayal of her in the compelling 1962 Constantine and the Cross alludes to her discovery of the cross of Christ. According to tradition, she went to Jerusalem in search of it; once there, she was presented with three candidates. She directed an ailing woman to touch these, and nothing happened with the first two crosses. But when the woman was cured on touching the third one, Helena proclaimed it the true cross. She then went on to uncover the crucifixion nails and, in fact, is today considered the patron of discovery itself. 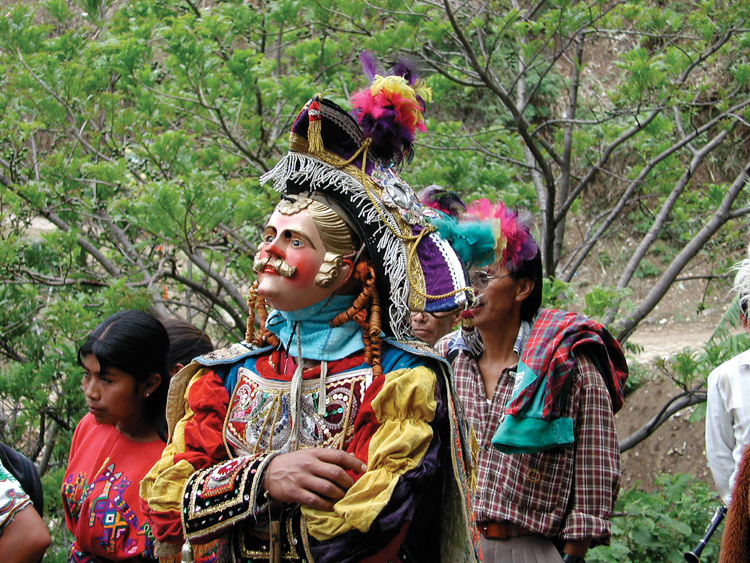 The Santa Cruz procession commemorates her own finds—17 centuries and a hemisphere away. 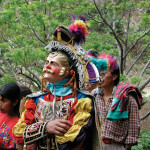 The fair’s climax, also on May 10, sees the emergence of masked horse dancers and wild toritos. These “bulls” are men running every which way, almost blindly, with their head and torso in a crate studded with rockets that go off as they charge. Screaming spectators part before them like schools of fish fleeing predators. 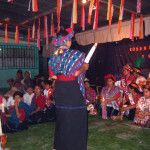 Toritos have disappeared from most Guatemalan ferias, but they live on in cloistered Santa Cruz. The traditional boozing is blunted with a gloppy dish called pulique, a blend of chicken broth, corn masa and achiote, a spicy, red-orange clay made from crushed seeds. Card tables display traditional sweets: candied figs, macaroons, confections of guava, pumpkin seeds or peanuts, homemade mints and more. Things begin winding down after the town’s name is emblazoned on the church campanile. “And then it’s time to start planning for next year,” says Ratcliffe. 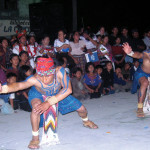 Outsiders wishing to experience the fair may lodge in Panajachel or in Santa Cruz itself. The boats disembark from Pana’s first dock, Muelle Tzanjuyú. Thank you! I’ve been here in Pana for a number of years, but didn’t know about the Santa Cruz la Laguna feria and the “raging bulls.” Oh My! Will have to try to get over there by boat to take a look this year… Gracias for the great story and interview with Dave from Iguana Perdida!